Great buy for that construction business. 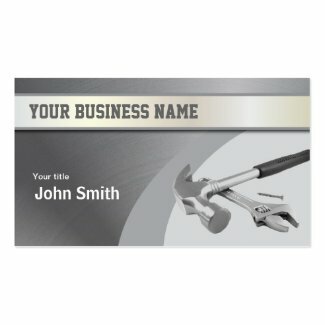 Promote your business with professional looking business cards. Really nice selection of thousand of business cards for anyone in business. Find your remarkable design here. Zazzle has 100% Satisfaction Guaranteed and the products quality is priceless. Be Smart - Save Money - Shop Online. Deluxeforms division of (deluxecontractorforms.com). This business card features a silhouette of a aquatic plant with fish along the bottom of one of Michigan's lakes enhancing a pretty blue coloring with a white reflection of a cloud in the clear water. Be professional look professional with these business cards. Personalize it to make it your own. Stand out in pretty blue that is good for your company business. Be Smart - Save Money - Shop Online. Deluxeforms (deluxecontractorforms.com). This business card captures a silver spotted skipper butterfly that is a welcome to any garden. Their distinctive feature is a large irregular silver patch on their wing. Their coloring is a dull shades of brown, gold, orange and silver. Their eyes are quite big when they stare at you. Buy this business card as is or tweak it to make it your own. Stop by again deluxeforms (deluxecontractorforms.com). 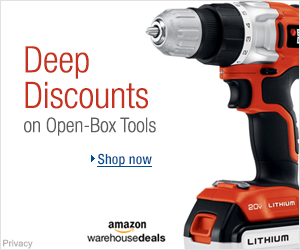 Shop Amazon Warehouse Deals - Deep Discounts on Open-box and Used Tools & Home Improvement . Be Smart - Save Money - Shop Online - great savings on Amazon Deluxecontractorforms.com (deluxecom-20) Store. This mug features a double roof elevation in black and white with red lettering. Buy this mug as is or tweak it to make it your own. Great way to promote your business or gift of appreciation to your customer. Be Smart - Save Money - Shop Online. Contact me if you would like this photo and/or any other photos on a different item. Stop by again - store is growing (restocked daily). Stop by again - deluxeforms (deluxecontractorforms.com). This business card features a professional looking double roof elevation that exhibits two chimney's and a vent. Available in Red, Gray and Green colors. Buy this business card as is or tweak it to make it your own. Be Smart - Save Money - Shop Online. Contact me if you would like this photo and/or any other photos on a different item. Stop by again - store is growing (restocked daily). Stop by Again. Deluxeforms. 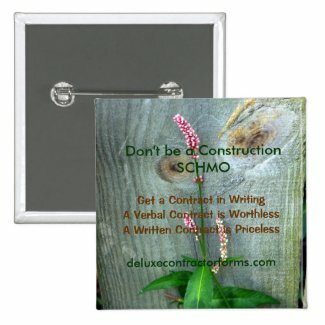 This button features a gray wood fence with a pink wildflower with saying "Don't be a Construction SCHMO = Get a Contract in Writing - A Verbal Contract is Worthless - A Written Contract is Priceless". Promote your business with buttons. Does your company have a quote? Company quotes look great on buttons. Buy this button as is or tweak it to make it your own as there are a few options available. This post card features colorful blue clouds with front side saying "Thank You For Your Business" and back side promoting discount off next project. Post cards are cheaper to send and keeps your company in your customer mind. Advertise your business with post cards. Buy as is or tweak it to make it your own. Be Smart Save Money Shop Online. Stop by again - deluxeforms.